Stunning A-Grade piece of polished Picture Jasper set with a substantial 925 sterling silver filigree bead and finished on a 20" black waxed cord thong necklace with sterling silver fittings. 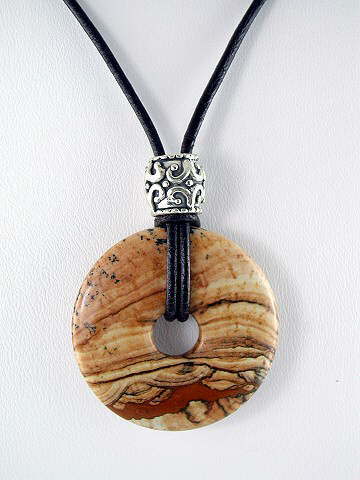 Picture Jasper is a harmonious stone, excellent for the highly strung, creative personality. Working with it (wearing or holding a piece) can help show us our hidden fears; fears which may have put psychological restrictions on our progress in life. An excellent stone for healing emotional wounds thereby restoring accord.